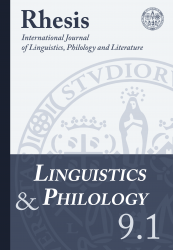 Linguistics and Philology aims at publishing outstanding contributions in all subfields of functional linguistics which show a methodological orientation to the empirical verification of theories. It welcomes contributions in all empirically-oriented language studies with application to both classical and modern languages, and it devotes particular attention to theoretically-grounded studies in historical linguistics. It also welcomes philological studies focusing on either textual or cultural issues. 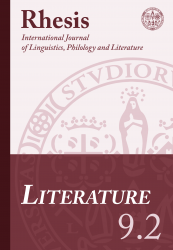 Literature welcomes contributions on both classical and modern literatures of the world, with a particular attention to critical innovation and interdisciplinary research. It features contributions on the diverse cultural manifestations of literature studies and related disciplines, with a special focus on hybridization and on the problematization of genres. Rhesis – Linguistics/Philology is published on a yearly basis in the month of June; Rhesis – Literature is published in the month of December. Both issues will features research articles, review articles, research notes, and book reviews. For further information and details about submission of manuscripts, please consult the ‘Notes for Contributors’ section. Contributions in English, French, German, Spanish and Italian are considered, but an abstract in English should always be included. Rhesis is an open access journal, thus a subscription fee is not required.